TEDxMileHigh exists to spread big ideas and elevate inspired citizenship in Colorado. It is a community of thinkers and doers, ideators and creators, activists and enthusiasts. TEDxMileHigh showcases innovative Coloradans, no matter the sector, who each give the ‘talk of their life’ around the power of ideas. This diverse group of thought leaders and innovators educate, inspire, and stimulate change with the ultimate goal being deep discussion and action across our communities. Tamra Ryan, CEO of Women’s Bean Project, was invited as one of the main speakers at this year’s TEDxMileHigh event that took place on Saturday, June 15, 2013 at the Ellie Caulkins Opera House. Tamra provided an insightful presentation in front of a crowd of 2,000 attendees on how when you believe in someone, they can finally begin to believe in themselves no matter what their background. She continued by saying that if we want to truly change the world, it has to start with belief in others’ potential. 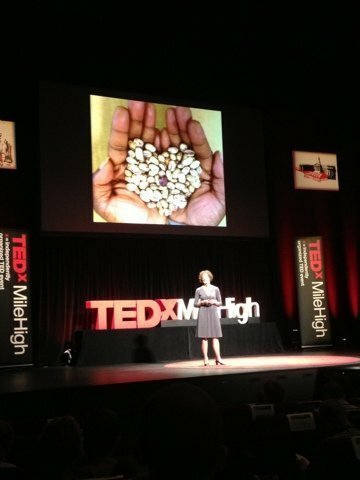 We will post Tamra’s presentation from TEDxMileHigh within the next several weeks and we encourage you to share her touching and powerful story with others. Click here to learn more about TEDxMileHigh.